Click a category to expand. C.M. Chini and A.S. Stillwell. (2018). “The State of U.S. Urban Water: Data and the Energy-Water Nexus.” Water Resources Research, 54(3), 1796-1811. C.M. Chini, M. Konar, and A.S. Stillwell. (2017). “Direct and indirect urban water footprints of the United States.” Water Resources Research, 53(1), 316-327. C.M. Chini and A.S. Stillwell. (2017). “Where Are All the Data? The Case for a Comprehensive Water and Wastewater Utility Database.” Journal of Water Resources Planning and Management, 143(3), 01816005. Z.A. Barker, A.S. Stillwell, and E.Z. Berglund. (2016). “Scenario Analysis of Energy and Water Trade-Offs in the Expansion of a Dual Water System.” Journal of Water Resources Planning and Management, 142(12), 05016012. C.M. Chini, K.L. Schreiber, Z.A. Barker, and A.S. Stillwell. (2016). “Quantifying Energy and Water Savings in the U.S. Residential Sector.” Environmental Science & Technology, 50(17), 9003-9012. Z.A. Barker and A.S. Stillwell. (2016). “Implications of Transitioning from De Facto to Engineered Water Reuse for Power Plant Cooling.” Environmental Science & Technology, 50(10), 5379-5388. Mentioned in Science. A.S. Stillwell and M.E. Webber. (2014). “Geographic, technologic, and economic analysis of using reclaimed water for thermoelectric power plant cooling.” Environmental Science & Technology, 48(8), 4588-4595. A.S. Stillwell, K.M. Twomey, R. Osborne, D.M. Greene, D.W. Pedersen, and M.E. Webber. (2012). “An Integrated Energy, Carbon, Water, and Economic Analysis of Reclaimed Water Use in Urban Settings: A Case Study of Austin, Texas.” Journal of Water Reuse and Desalination, 1(4), 208-223. W.N. Lubega and A.S. Stillwell. (2019). “Analyzing the economic value of thermal power plant cooling water consumption.” Water Resources and Economics, in press. L.H. Logan and A.S. Stillwell. (2018). “Water Temperature Duration Curves for Thermoelectric Power Plant Mixing Zone Analysis.” Journal of Water Resources Planning and Management, 144(9), 04018058. L.H. Logan and A.S. Stillwell. (2018). “Probabilistic assessment of aquatic species risk from thermoelectric power plant effluent: Incorporating biology into the energy-water nexus.” Applied Energy, 210(1), 434-450. W.N. Lubega and A.S. Stillwell. (2018). “Maintaining electric grid reliability under hydrologic drought and heat wave conditions.” Applied Energy, 210(1), 538-549. T.A. DeNooyer, J.M. Peschel, Z. Zhang, and A.S. Stillwell. (2016). “Integrating water resources and power generation: The energy-water nexus in Illinois.” Applied Energy, 162(1), 363-371. A.S. Stillwell and M.E. Webber. (2013). “Evaluation of power generation operations in response to changes in surface water reservoir storage.” Environmental Research Letters, 8(2), 1-15. A.S. Stillwell and M.E. Webber. (2013). “A Novel Methodology for Evaluating Economic Feasibility of Low-Water Cooling Technology Retrofits at Power Plants.” Water Policy, 15(2), 292-308. N.S. Alhajeri, P. Donohoo, A.S. Stillwell, C.W. King, M.D. Webster, M.E. Webber, and D.T. Allen. (2011). “Using market-based dispatching with environmental price signals to reduce emissions and water use at power plants in the Texas grid.” Environmental Research Letters, 6(4), 1-9. A.S. Stillwell, C.W. King, M.E. Webber, I.J. Duncan, and A. Hardberger. (2011). “The Energy-Water Nexus in Texas.” Ecology and Society, 16(1), 2. R. William, P. Gardoni, and A.S. Stillwell. (2019). “Reliability-Based Approach to Investigating Long-Term Clogging in Green Stormwater Infrastructure.” Journal of Sustainable Water in the Built Environment, 5(1), 04018015. P.A. Malinowski, J.S. Wu, S. Pulugurtha, and A.S. Stillwell. (2018). 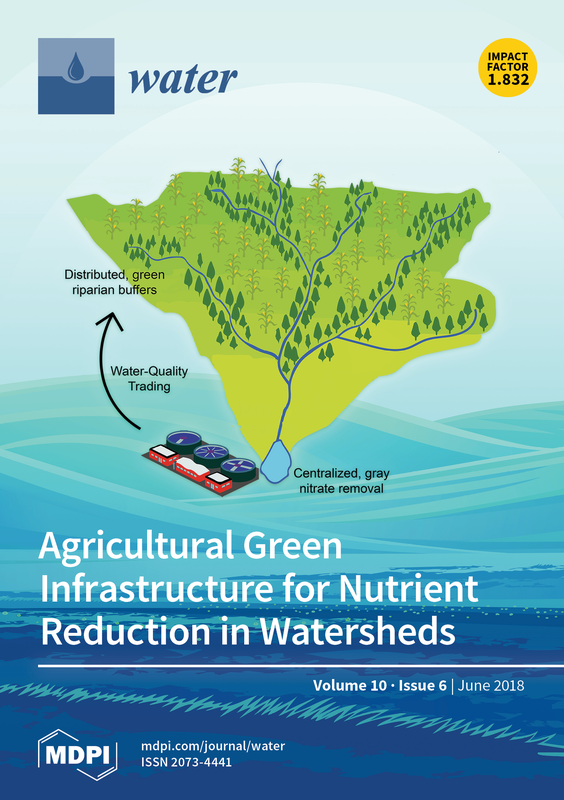 “Green Infrastructure Retrofits and Impervious Area Reduction: Potential Improvements to Urban Stream Quality and Contribution by Property Type.” Journal of Sustainable Water in the Built Environment, 4(4), 04018012. Featured as Editor’s Choice. J.F. Canning and A.S. Stillwell. (2018). “Nutrient Reduction in Agricultural Green Infrastructure: An Analysis of the Raccoon River Watershed.” Water, 10(6), 749. Featured on journal cover. R. William, J. Garg, and A.S. Stillwell. (2017). “A game theory analysis of green infrastructure stormwater management policies.” Water Resources Research, Special Issue on “Socio-hydrology: Spatial and Temporal Dynamics of Coupled Human-Water Systems,” 53(9), 8003-8019. Featured in editor’s highlight. R. William and A.S. Stillwell. (2017). “Use of Fragility Curves to Evaluate the Performance of Green Roofs.” Journal of Sustainable Water in the Built Environment, 3(4), 04017010. C.M. Chini, J.F. Canning, K.L. Schreiber, J.M. Peschel, and A.S. Stillwell. (2017). 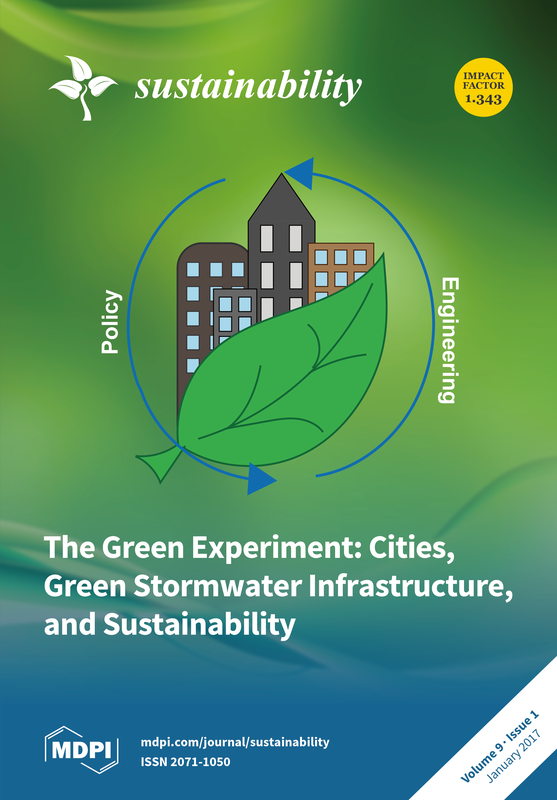 “The Green Experiment: Cities, Green Stormwater Infrastructure, and Sustainability.” Sustainability, 9(1), 105. Featured on journal cover. R. William, A. Goodwell, M. Richardson, P.V.V. Le, P. Kumar, and A.S. Stillwell. (2016). “An environmental cost-benefit analysis of alternative green roofing strategies.” Ecological Engineering, 95(1), 1-9. P.A. Malinowski, A.S. Stillwell, J.S. Wu, and P.M. Schwarz. (2015). “Energy-Water Nexus: Potential Energy Savings and Implications for Sustainable Integrated Water Management in Urban Areas from Rainwater Harvesting and Gray-Water Reuse.” Journal of Water Resources Planning and Management, Special Issue on Sustainability, 141(12), A4015003. C.M. Chini, L.A. Djehdian, W.N. Lubega, and A.S. Stillwell. (2018). “Virtual water transfers of the US electric grid.” Nature Energy, 3(12), 1115-1123. A.S. Stillwell, A.M. Mroue, J.D. Rhodes, M.A. Cook, J.B. Sperling, T. Hussey, D. Burnett, and M.E. Webber. (2017). “Water for Energy: Systems Integration and Analysis to Address Resource Challenges.” Current Sustainable/Renewable Energy Reports, 4(3), 90-98. A.S. Stillwell. (2015). “Sustainability of Public Policy: Example from the Energy-Water Nexus.” Journal of Water Resources Planning and Management, Special Issue on Sustainability, 141(12), A4015001. K.T. Sanders, C.W. King, A.S. Stillwell, and M.E. Webber. (2013). “Clean Energy and Water: Assessment of Mexico for Improved Water Services and Renewable Energy.” Environment, Development, and Sustainability, 15(5), 1303-1321. C.W. King, A.S. Stillwell, K.M. Twomey, and M.E. Webber. (2013). “Coherence Between Water and Energy Policies.” Natural Resources Journal, 53(1), 117-215. K.M. Twomey, A.S. Stillwell, and M.E. Webber. (2010). “The unintended energy impacts of increased nitrate contamination from biofuels production.” Journal of Environmental Monitoring, 12(1), 218-224. C.W. King, A.S. Holman, and M.E. Webber. (2008). “Thirst for energy.” Nature Geoscience, 1(5), 283-286. A.S. Stillwell and M.E. Webber. (2016). “Predicting the Specific Energy Consumption of Reverse Osmosis Desalination.” Water, 8(12), 601. E.A. Grubert, A.S. Stillwell, and M.E. Webber. (2014). “Where Does Solar-Aided Seawater Desalination Make Sense? A Method For Identifying Sustainable Sites.” Desalination, 339(1), 10-17. M.E. Clayton, A.S. Stillwell, and M.E. Webber. (2014). “Implementation of brackish groundwater desalination using wind-generated electricity: A case study of the energy-water nexus in Texas.” Sustainability, 6(2), 758-778. C.M. Beal, A.S. Stillwell, C.W. King, S.M. Cohen, H. Berberoglu, R.P. Bhattarai, R. Connelly, M.E. Webber, and R.E. Hebner. (2012). “Energy Return on Investment for Algal Biofuel Production Coupled with Wastewater Treatment.” Water Environment Research, 84(9), 692-710. A.S. Stillwell, C.W. King, and M.E. Webber. (2010). “Desalination and Long-Haul Water Transfer as a Water Supply for Dallas, Texas: A Case Study of the Energy-Water Nexus in Texas.” Texas Water Journal, 1(1), 33-41. A.S. Stillwell, D.C. Hoppock, and M.E. Webber. (2010). “Energy Recovery from Wastewater Treatment Plants in the United States: A Case Study of the Energy-Water Nexus.” Sustainability, 2(4), 945-962.